1. Preheat broiler and coat a baking sheet or broiling pan with olive oil. 2. Rinse the fish and pat dry with paper towels. 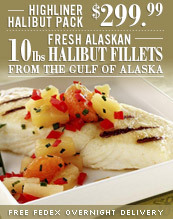 Place Alaskan Halibut on the greased pan, and brush with olive oil or coat with olive oil cooking spray. Squeeze the juice from the lemon wedges over the entire fillet, and season generously with salt first, then garlic and dill. 3. 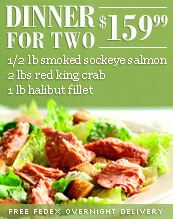 Broil for 15 to 20 minutes in the preheated oven, until the fillet is opaque and can be flaked with a fork.